While New Zealand’s South Island is home to dramatic mountain scenery and endless expanses of wilderness, the North Island has a lot to offer too. 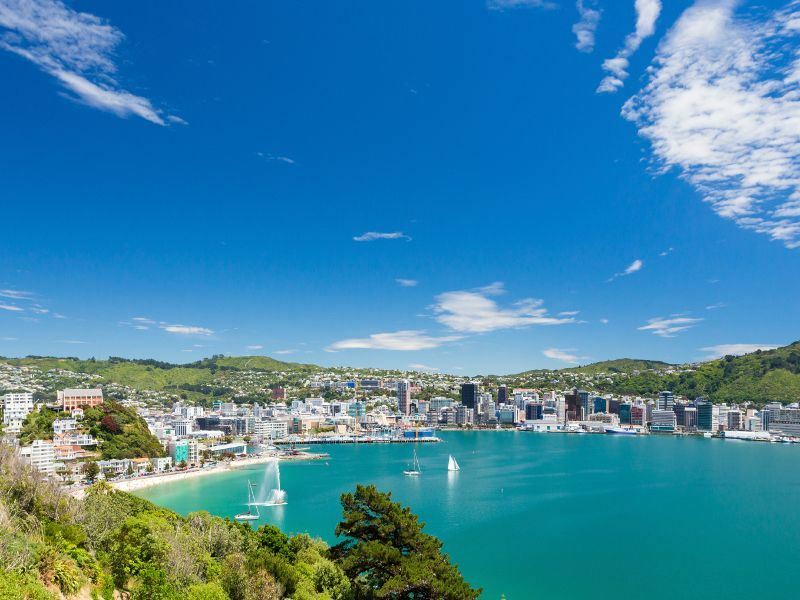 Incredible geothermal activity, some of the country’s best beaches, the second largest wine region, fantastic shopping in Auckland, and some of the best cuisine in the capital city of Wellington. 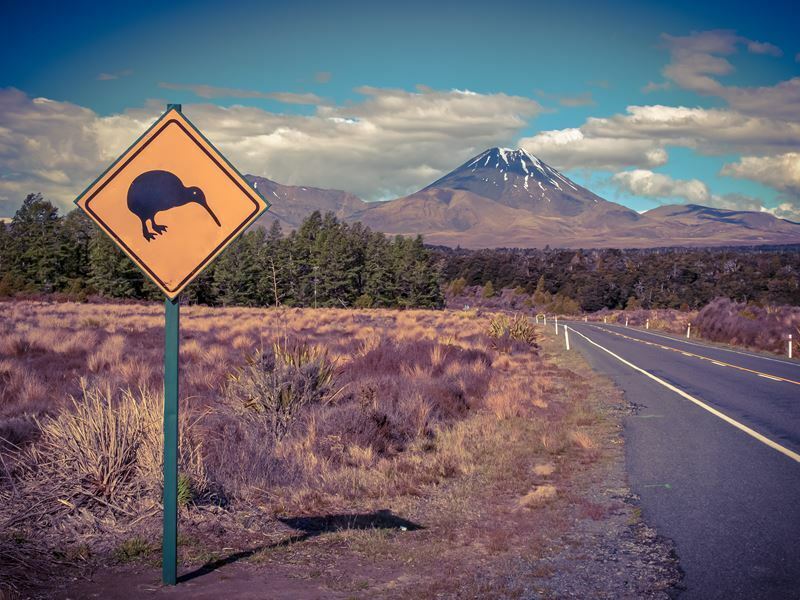 With so much to see and do, one of the best ways to get the most out of your North Island holiday is to do it by motorhome, enjoying the freedom and independence of the open road, which allows you to take things at your own pace in a virtual apartment on wheels. Auckland is a great place to start your exploration of the island, as New Zealand’s biggest city, and an international air travel hub. If you want to shop, this is the place to do it as it hosts many of the nation’s top fashion designers, as well as markets offering bargain prices on items like arts and crafts, vintage goods and fresh local foods. 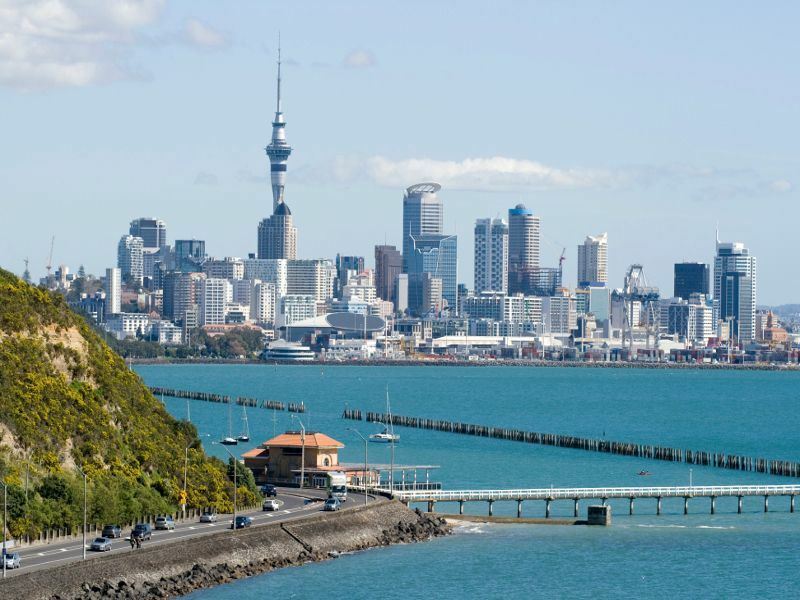 It’s also home to a wealth of museums, including the Auckland Art Gallery, the largest art institution in New Zealand with more than 15,000 works of modern, contemporary and historic art; a gorgeous waterfront precinct, and the Sky Tower. The tallest man-made structure in the country, the Sky Tower is the place to go for taking in 360-degree views of the city. The courageous even leap down from its 630-foot Skyjump for an unforgettable thrill. When you’ve had your fill of the city, there’s lots to explore in the surrounding region, including scenic Rangitoto Island. Located just off the coast, it’s renowned for its distinctive symmetrical cone. Take the ferry over to hike up to its summit, exploring the black lava caves among the volcanic landscape along the way. Waiheke Island is another option. Just a thirty-minute ferry ride from the city and you’ll feel as if you’re worlds away from the mainland. Walk the secluded beaches, stroll through olive groves and sample wines at picturesque vineyards. Just minutes from the main village of Oneroa, Oneroa beach sits at the edge of warm, calm waters that are ideal for a swim. Take a cruise through this subtropical micro-region that contains 144 islands, secluded bays, sandy beaches and an abundance of wildlife. In fact, here you can even swim alongside the dolphins that call this area home. Penguins and whales are often spotted too. 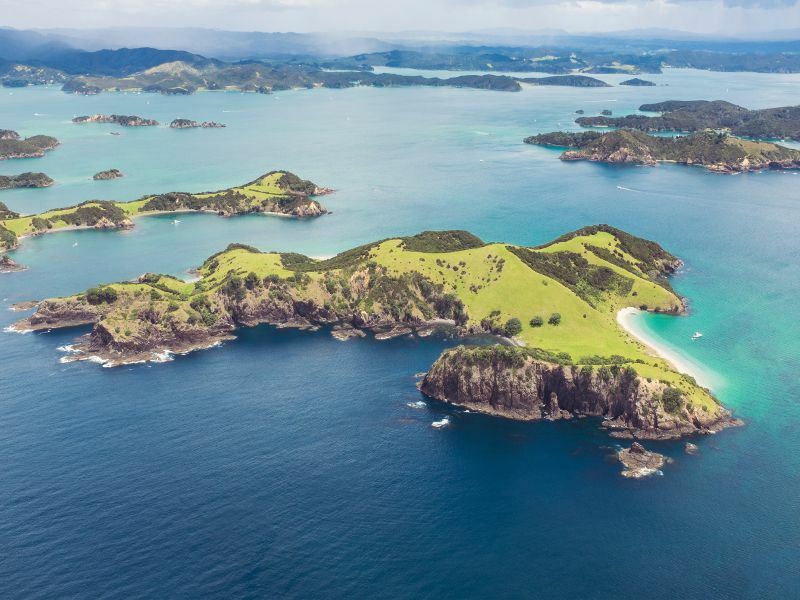 A must-do is to explore the nation’s most important historic site, the very spot where the Waitangi Treaty was signed, which features the award-winning Waitangi Treaty Grounds and Museum of Waitangi. Explore the museum, visit the colonial mission and magnificent waka taua (Maori war canoe), and watch a cultural performance inside the carved Maori meeting house. Just across the bay is the charming town of Russell, with its beautiful seaside setting and historic buildings that give it a wonderfully romantic feel. Despite its peaceful ambiance today, Russell was once known as the “hell hole of the Pacific,” with life along the waterfront rough, rowdy and downright violent. History buffs are sure to appreciate a visit, as the country’s first European settlement and seaport. The streets, which today are lined with art galleries, restaurants and cafes, retain their original layout and names from the mid-19th century. Head west from Russell to the Hokianga, where you can take in picturesque views of sand dunes and a beautiful harbour. 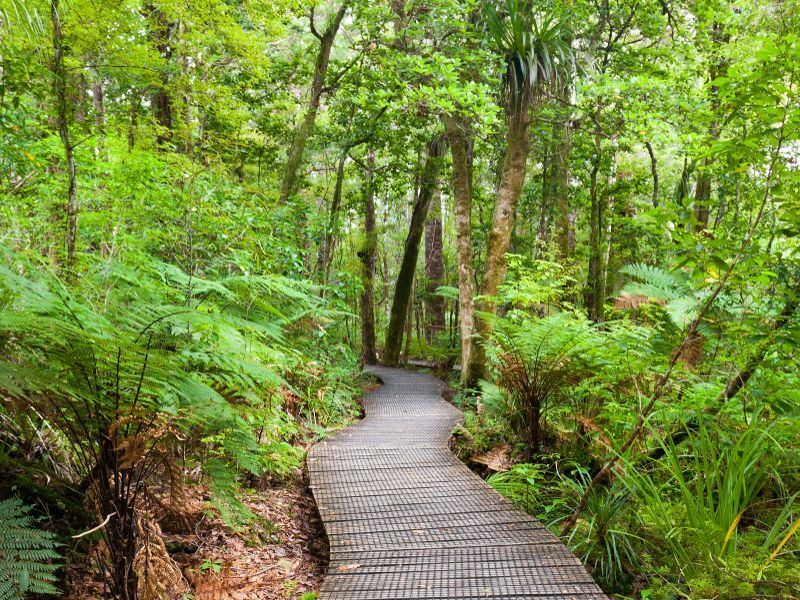 Go on a stroll through the forest to see the two largest Kauri trees on the planet, and soak up the history of this region where the very first Maori explorer landed over a thousand years ago. The famous Kauri of the Waipoua Forest sit at southern edge of the Hokianga, while the world’s largest Kauri tree, the approximately 2,000-year-old “King of the Forest,” is just a few minutes’ walk from the road. Further south in the west coast village of Matakohe, take time to explore the Kauri Museum which features exhibits telling the story of the region’s early pioneering days as well as the largest collection of Kauri gum and Kauri furniture in the world. 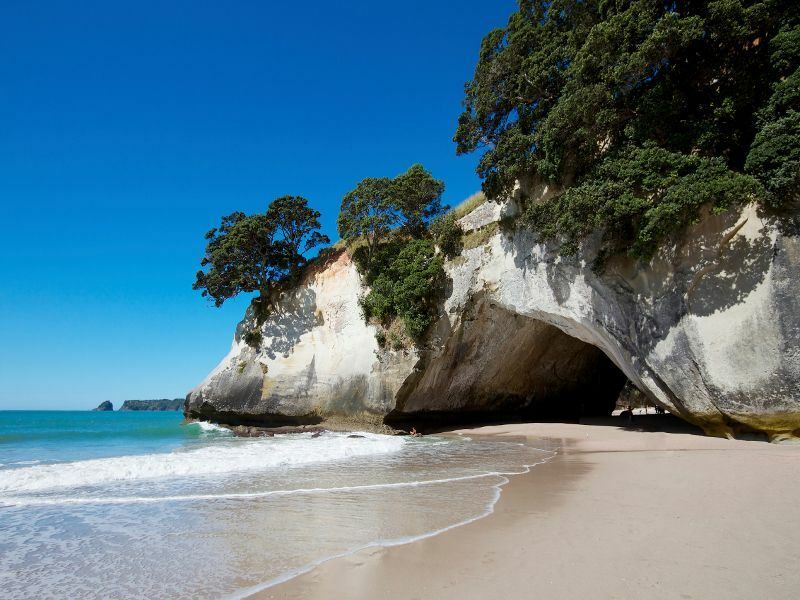 Just east of the towns of Warkworth and Matakana on a remote peninsula, Tawharanui Regional Park showcases some of the most stunning and secluded white sand beaches in the Auckland region. Venture south along the Hibiscus Coast, located on the east coast of the Auckland region, where you’ll have the chance to visit more of the area’s top beaches as the landscape transforms from city views to rural hills and farmland. Stop at the Firth of Thames, home to wide intertidal flats that draw thousands of migratory wading birds before continuing your journey to the east coast and Coromandel. If you take the Pohutukawa Coast drive, it’ll take a little longer to get there, but you’ll experience one of the area’s most breathtaking routes, named after the gorgeous red-flowering trees that border its shoreline. History enthusiasts won’t want to miss the Howick Historical Village, a living museum featuring over 30 original colonial buildings. 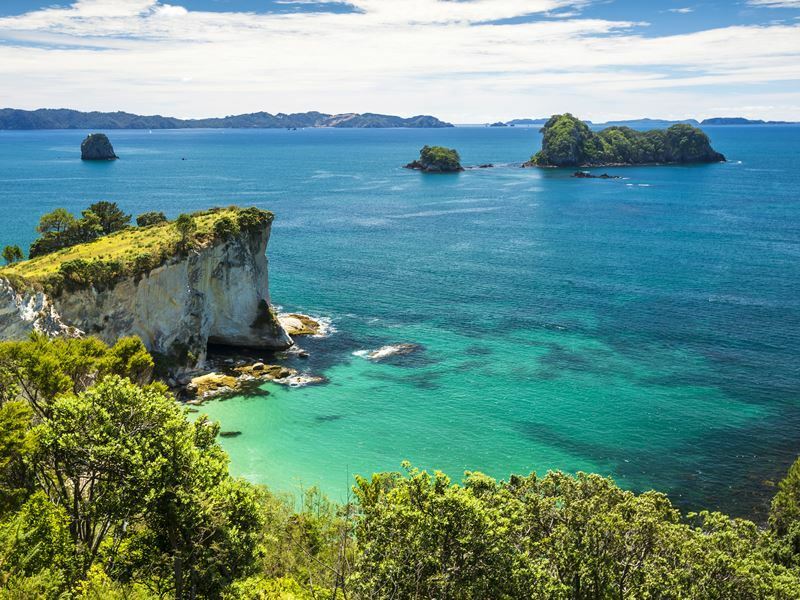 Once on the Coromandel Peninsula, you’ll be surrounded by stunning mountain scenery, unspoiled beaches, native forests and a fabulous laid-back vibe, along with a rich pioneering and mining history. Experience local history by touring the Thames Historical Museum and the School of Mines & Mineralogical Museum. One of the best ways to explore the magnificent coastline and powdery white sand beaches, is to get out on the water in a kayak. Paddle around Cathedral Cove, an iconic cliff face with a massive arch at its middle, or, if you prefer to stay on land, you can access the famous cove and its huge limestone formations on foot by taking the one-and-a-half-hour Cathedral Cove walk from Grange Road. Gemstone Bay, along the way to Cathedral Cove, is home to an outstanding snorkeling trail, where you can swim out to a series of marker buoys that showcase information about the various fish species you might meet. Leaving the Coromandel, heading south to Rotorua, stop just before Waihi to take a journey into the past with a ride on a heritage train with Goldfields Railway. 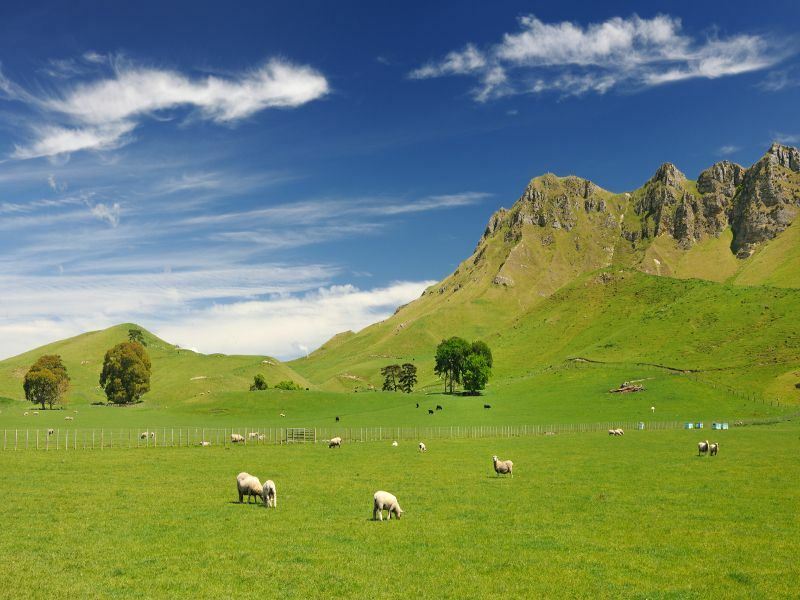 The trip will bring you to the eastern end of the awe-inspiring Karangahake Gorge, passing through an area that’s especially rich in history, including the historic goldmining that shaped much the region. Before reaching Rotorua, if you’re a fan of “Lord of the Rings” and the “Hobbit,” visiting Matamata is a must. Just outside of this small town, you can visit the actual Hobbiton set, home to Bilbo Baggins. Pose for photos in front of the hobbit holes, and you’ll have a fabulous souvenir of your time in New Zealand. 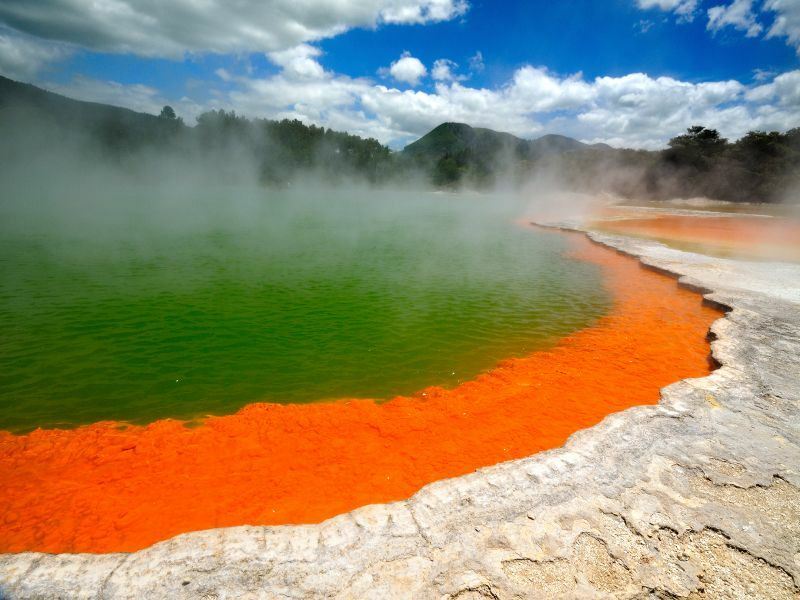 Once in Rotorua, you’ll be in the heart of the most active volcanic region on Earth. The Waimangu Valley is a thermal wonderland, with its geysers, bubbling mud pools and hot springs. The valley was completely reshaped when Mount Tarawera erupted in 1886, and the Maori villages of Te Wairoa, Te Arihi and Moura completely disappeared under the mounds of ash and lava. This is a great place to take an organized tour, where you’ll walk the shores of Lake Rotomahana and pass the now inactive Waimangu Geyser. Cathedral Rocks, Warbrick Terrace and the Waimangu Cauldron, a 4-hectares lake of steaming hot water, are all included as well, and just below Mount Tarawera, you’ll discover Maori rock drawings on the shores of Lake Tarawera. Cap off the excursion with a boat trip across the water to the partly excavated buried village of Te Wairoa. 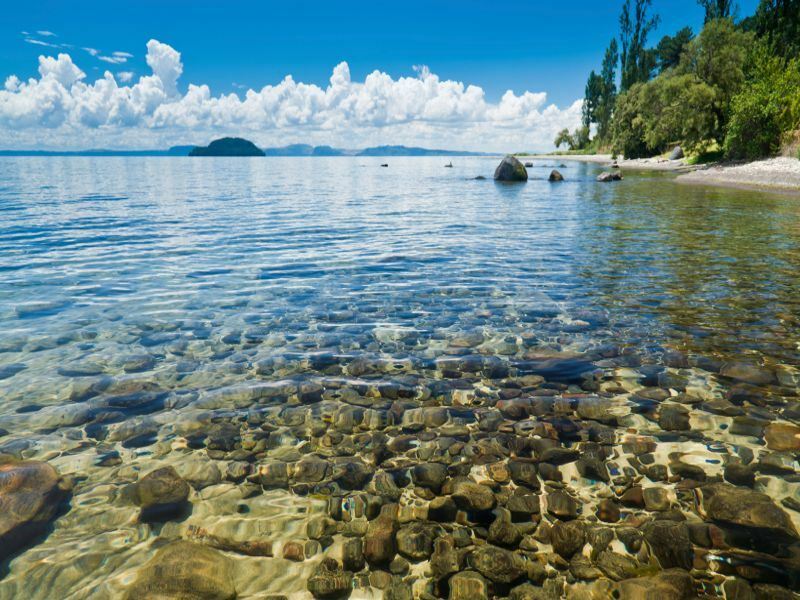 Venturing south of Rotorua toward Napier, you’ll reach the legendary Lake Taupo region, often referred to as nature’s ultimate playground, renowned for adrenaline-packed adventures as well as mineral hot pools for relaxation. While you’re here, be sure to check out Huka Falls, a thundering waterfall renowned for its striking turquoise hue, as well as being the nation’s most visited natural attraction. For a unique perspective, take a boat trip to its base, where you’ll be close enough to feel the spray on your skin. If its big thrills you’re after, this is one of the best spots in the world for sky diving, including the largest commercial drop zone on the planet. This life-changing experience offers the chance to truly take in a bird’s-eye view of the landscape, including dense forest, the glistening waters of the lake, volcanoes and some of the very spots scenes of the “Lord of the Rings” were shot. The Hawke’s Bay region, which is centred around the twin cities of Napier and Hastings, is a wine enthusiast’s dream. It features some 70 wineries that make it easy to create your own self-drive wine trail. Spend the day sampling amazing wines, and then wander through downtown Napier, one of the best-preserved Art Deco towns on the planet. Look south across the bay from Napier, and you can see the white cliffs of Cape Kidnappers, a scenic area known for hosting the largest mainland gannet colony in the world. One of the most interesting ways to experience it is to take a tractor tour along the beach, where you can spend time with and get remarkably close to the gannets in their natural habitat. On your way to Martinborough, you’ll pass along the Manawatu Gorge, another one of New Zealand’s spectacular natural playgrounds. The gorge, which divides the Tararua and Ruahine mountain ranges, is the only place in the country where a river begins its journey on the opposite side of the main divide, to where it joins the sea. A landmark of geographical magnificence, here you can view the sculpture of an ancient Maori warrior, enjoy a swim in the water, and one of a number of walks through lush green forest, over bridged streams and under dense treetop canopy. Historic Greytown makes another good stop, home to the highest concentration of Victorian colonial buildings in all of New Zealand. In Martinborough, explore the boutique vineyards that are dotted throughout the village, or if you prefer a handcrafted beer, pop into Martinborough Brewery instead. Once in Wellington, be sure to explore Cuba Street. While it’s not historically related to the island nation of Cuba, it pays homage to the multi-ethnic country, and offers the chance to sip authentic Cuban espresso, dine on Cuban-inspired dishes, and explore an eclectic collection of unique boutiques, music shops, art galleries and cafes. It’s also known for its diverse array of street entertainers, from marionette shows and fire performers to talented musicians. For majestic views of the city, take the cable car from Lambton Quay to the hills of Kelburn. It ends in the botanical gardens, an ideal place for a stroll.